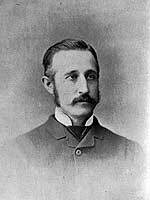 Born at Hamilton, Ontario on 6 June 1850, eldest son of Charles and Bridget Barrett, he took training as a treacher, taught school for ashort time, then entered the Holy Cross Jesuit College at Worcester, Massachusetts. On leaving the college, he became principal of St. Mary’s Model School at Hamilton. In 1873, he accepted a position with the Inland Revenue Department, being promoted to the position of Inspector by 1885. In 1890, he became Managing Director and Editor-in-Chief of the Northwest Review. In 1875, he married Sarah Maria O’Brien of Hamilton, Ontario with whom he had five daughters and two sons. A Catholic, Barrett was the Winnipeg taxpayer who refused to pay his school taxes because the Manitoba School Act of 1890 denied his constitutional rights. This suit, Barrett v. the City of Winnipeg, brought with federal government support, touched off the legal aspects of the Manitoba School Question. After losing in a Manitoba court, Barrett won in the Supreme Court of Canada, which declared that the Manitoba act plainly set up a denominational system. Along with another similar case, the suit was appealed in 1892 to the Judicial Committee of the Privy Council, which overturned the Supreme Court decision. Barrett received honorary degrees from the University of Ottawa and Holy Cross Jesuit College. He was a member of the council of the University of Manitoba. Priests and Politicians: Manitoba Schools and the Election of 1896 by Paul Crunican (1974).